I am a qualified accountant having lived in France, Italy & Canada during my lifetime. I am now semi retired living 10 miles south of London. We love Menton & the cental location of this apartment. We visit 2/3 times a year & treat it as a home from home. The apartment is full of home comforts. We have recently installed a wall mounted unit in the main living area which provides cool air during the summer and heating during the winter. Operating manual available in flat, if required. Can be provided locally at cost of €30 and consists of 1 duvet cover 1 fitted/flat bed sheet, 1 pair of pillowcases, 2 bath towels and 2 hand towels. Cable provided via Orange LiveBox. There are a selection of snorkels, goggles, inflatables, buckets and spades, bats and balls and beach mats that can be used plus deckchairs and sun umbrellas. The kitchen is fully fitted and the lounge area is attractively furnished and is ideally suited for a family setting. The apartment has double glazing installed throughout. Everything we needed was in the apartment. Perfect location, easy walking to station, beach, town. It was a lovely apartment in a incredibly convenient location. I would recommend it to anyone and will use it again if I return to Menton. We spent 4 nights in the property during the Lemon Festival. Everything was just fine. Thank you for your positive feedback & we hope you enjoyed your stay. Was it Roberta or Micaela that met you & were they polite & helpful? The apartment had many advantages to offer. The location was above a bakery & butcher shop. Around the corner from a produce stand and small grocery store as well. Did I mention that is a block off the beach? Miceala was exceptional friendly and helpful (speaking several languages too.). We felt right at home for the week. No need for a car either because the train station is less than 10 mins by foot. Note: the building has an elevator. I have been to this apartment a number of times now and always come home feeling relaxed, rejuvenated and ready to get back to my busy life!! The Lemon Festival was another great experience.The apartment is very well situated with shops, bars and cafes all within walking distance and the apartment itself is very well equipped. Flat screen TV and plenty of creature comforts to make you feel at home. Thinking of when to book my next trip!?! We had a great time in this apartment in the centre of Menton. It was perfectly located at about 1km from the old town and from the main railway station. It is also 200m from the beach. 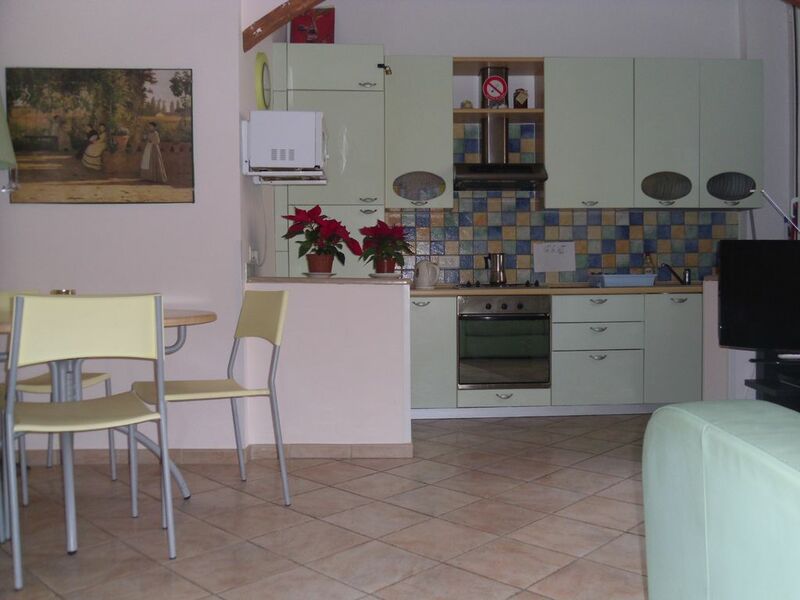 The building is safe and secure and the apartment is very clean and nicely decorated. Because it is a family-owned apartment, it has all the facilities that a traveller could need. We were particularly impressed with the new flat screen TV which had many foreign language stations and also with the extremely effective wifi network. Despite its central position, the apartment is quiet; downstairs there is a boulangerie where you can buy fresh croissants in the morning (we loved it). We don't drive and it was possible to go everywhere we wanted by public transport or on foot. If you turn right out of the apartment, you can walk to Rocquebrune-Cap Martin. Turn left and you will soon be in Italy! Menton is situated about 8 kilometers east of Monte Carlo and a similar distance from Ventimiglia, in Italy. Excellent travel facilities are available close to the apartment - bus, train, coach and air. Attractive mountain range overlooks Menton.